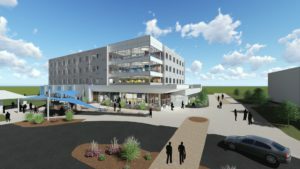 REINHARDT/WILSON JOINT VENTURE AWARDED NEW $20 MILLION ACADEMIC AND RESIDENCE HALL AT COLUMBIA COLLEGE - S. M. Wilson & Co. REINHARDT/WILSON JOINT VENTURE AWARDED NEW $20 MILLION ACADEMIC AND RESIDENCE HALL AT COLUMBIA COLLEGE - S. M. Wilson & Co.
Construction is expected to be complete by July 2019. S. M. Wilson is a full-service construction management, design/build and general contracting firm with headquarters in St. Louis. S. M. Wilson is one of the largest general construction and construction management firms in the St. Louis area. The company posted $230 million in 2017 revenues and ranks 271st in Engineering News-Record’s 2017 list of Top 400 commercial contractors nationwide. For more information, visit www.smwilson.com.